federalism and devolution of powers to states. 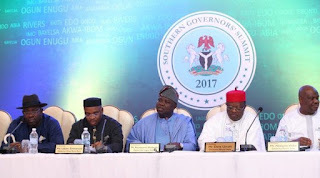 It is reported that the governors, in a communique at the end of the meeting, read by the host Governor Akinwunmi Ambode of Lagos State, also resolved to collaborate with one another for the growth and development of their economies. Aside Governor Ambode, the meeting was attended by Governors of Ogun, Senator Ibikunle Amosun; Oyo, Seantor Abiola Ajimobi; Osun, Ogbeni Rauf Aregbesola, Ebonyi, David Umahi; Edo, Mr. Godwin Obaseki; Ondo, Arakunrin Oluwarotimi Akeredolu; Abia, Mr. Okezie Ikpeazu; Enugu, Mr. Ifeanyi Ugwuanyi; Bayelsa, Mr. Seriake Dickson and Ekiti State, Mr. Ayodele Fayose. Governors of Cross River, Anambra and Delta states were represented by their deputies – Mr. Evara Esu; Dr. Ikem Okeke and Mr. Kingsley Otuaru, respectively. Earlier, Governor Ambode, while welcoming his colleagues to the meeting, reflected on the clamour for true federalism and devolution of powers, saying that states will benefit from the envisaged restructuring. The governor added: “States are disparaged for always carrying begging bowls to Abuja in quest of hand-outs from the Federal Government. This is a function of our present national constitution that burdens the Federal Government with activities and responsibilities that rightly fall within the province of states. Ambode said these victories belonged, not only to Lagos, but also to other states, adding that, if Lagos could achieve so much by fighting alone, the Southern Governors’ Forum will accomplish more through collective planning and strategy. He said: “It is important for this forum to comprehensively look at the proposed amendments with a view to working with our respective Houses of Assembly to ensure a coordinated response on our part that will strengthen the practice of democracy, federalism, constitutionalism and the rule of law. The governor paid tribute to former Lagos State Governor Bola Tinubu for his initiative, recalling that he hosted the first meeting of the forum in Akodo Beach Resort, Ibeju-Lekki, whe he was at the helm of affairs. He said: “Another major victory won towards strengthening the country’s practice of true federalism was the declaration bybthe Supreme Court in 2002 that the then prevalent practice of the Federal Government deducting monies from the Federation Account as a first charge for the funding of Joint Venture Contracts, the NNPC priority projects, servicing of Federal Government’s external debt, the judiciary and the Federal Capital Territory (FCT) and other federal obligations were illegal and unconstitutional.